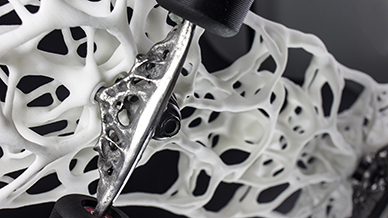 3D Systems based out of Rock Hill, South Carolina is a pioneer in 3D printing technology. Some of its major accomplishments include inventing 3D printing with Stereolithography (SLA) and commercializing it in 1989, as well as inventing and commercializing Selective Laser Sintering (SLS) in 1992. Today, 3D Systems’ huge range of 3D printers are used for production-grade manufacturing in aerospace, automotive, patient specific medical devices and a variety of consumer, electronic, and fashion accessories. Recently, the Cooper Hewitt – Smithsonian Design Museum in New York approached 3D Systems with an opportunity to participate in an exhibit. The collaboration centered around creating an exhibit to highlight the new processes in which objects are being made and designed using innovative software and new manufacturing methods. After some initial brainstorming, the team at 3D Systems determined multiple products that it felt should be displayed in the exhibit. One of the products that was decided upon was a 3D printed, structurally efficient skateboard. The goal here was to improve upon a product that has been fairly unchanged for many years. The team at 3D Systems wanted to see how they could change the way a skateboard is designed and produced. Knowing that they wanted to create a skateboard lighter than others on the market, 3D Systems used Inspire to optimize the deck and trucks of a traditional skateboard design. Inspire helped 3D Systems to generate the ideal skateboard shape that was used to create the final design. 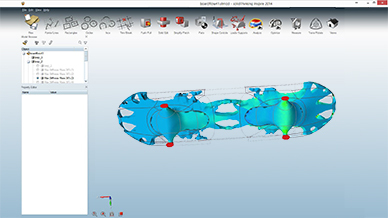 The first step in this process involved 3D Systems using Inspire to run multiple optimizations with slightly different load cases and percentages of material retention to find the basic form of the product. In the skateboard’s case, no manufacturing constraints were applied as 3D printing gives its users the freedom to manufacture shapes that traditional techniques do not. In all, 3D Systems used Inspire to generate 20-30 different concepts. Each of these design concepts were then analyzed in Inspire to determine any weak points in the design. 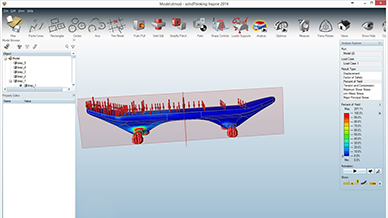 After reviewing multiple concepts generated in Inspire, the 3D Systems’ team determined the winning concept for the skateboard’s deck, as well as trucks. Once the final concept was selected, the team at 3D Systems exported the shape into CAD. 3D Systems refined the shape into the final design that was to be 3D printed. Design and 3D print a structurally sound, lightweight skateboard. A process incorporating Inspire to generate the ideal skateboard deck and truck material layout.